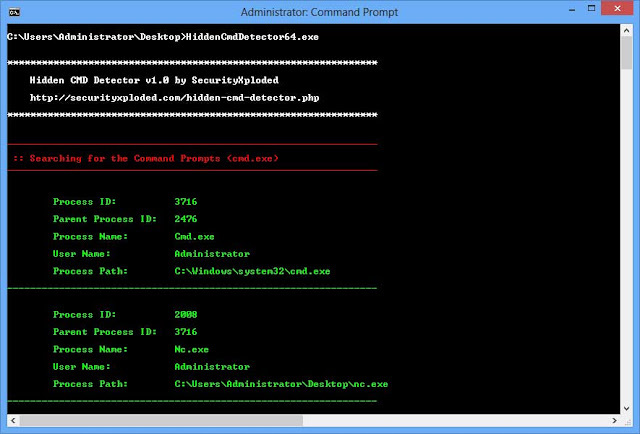 Hidden CMD Detector is the free tool to discover Hidden Command prompts and detect any Hacker presence on your system. The first thing any Hacker does on getting access to remote system is to run a hidden Command shell. This tool can help you to automatically detect any such hidden cmd prompts and keep your system safe from hackers. This tool can be easily automated to run at certain interval. It supports 3 output modes (normal, one liner, xml) making it easy to parse the result through the automation scripts. It will be ideal tool to run on unattended machines periodically to detect any hacker activities and alert the administrators.